Drooling, pacing, panting, barking, hiding and destructive behavior can be helped with this fast acting, non-sedating liquid. 15ml. Ingredients: Phosphorus, Rhododendron, Borax, Theridion Curassavicum, Chamomilla 6c & 30c in 20 USP alc. in purified water. A full dose may be given every 15 minutes up to 4 doses if needed, before or during storms or fireworks. For pets home alone, put 2 doses in water bowl. As they drink, they will receive a dose. Dosing may be repeated as recommended above, throughout the day if multiple storms or stressful situations occur. Dosing may be repeated throughout the trip if needed. If pet is crated, remedy may be dropped around bedding area also. For pets under 1 lb, 2 drops in water and follow dosing instructions above. 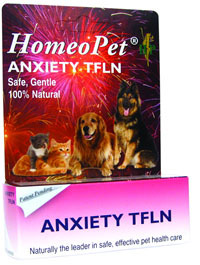 Remedy only needs to be used if pet is exhibiting symptoms of anxiety. My 1 yr old mini schnauzer was a basket case every time we had our bad thunder and lightning storms. She panted and paced and her little heart beat 1000 times a minute as soon as she detected one was coming. Till we discovered TFLN. What a terrific find. Now, we simply squirt some in her mouth when we hear the first thunder roll and give her another squirt if the storm continues past 1/2 hour. She remains calm with no pacing and we no longer worry that her heart might just stop from pounding so hard. We luv this natural homeopathic remedy.